In this experiment we manged to study the melting of one single silver nano particle of size 50 nm. What we do is driving a electric current through the sample and continually increasing the power which results in melting of the particles. After the particle have melted a carbon-shell is left behind and the resulting drop in electric resistance is about 800 Ohm. 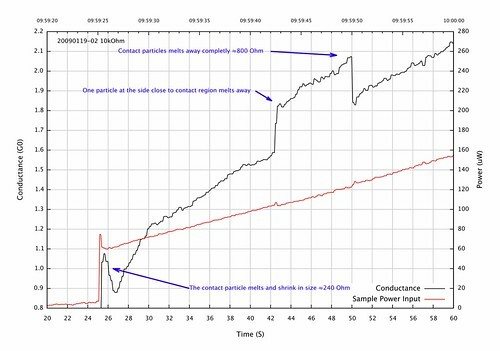 If one checks the movie from the experiment, one can see that in the beginning of the experiment the same contact particle as mentioned above melts a little with a resulting small decrease in size followed by a resistance increase of 240 Ohm.